With bananas and oatmeal too. But really, I just couldn’t put all of that in the title. It would start getting out of control. And nobody wants that. Besides, the chocolate and peanut butter are really the most important parts. 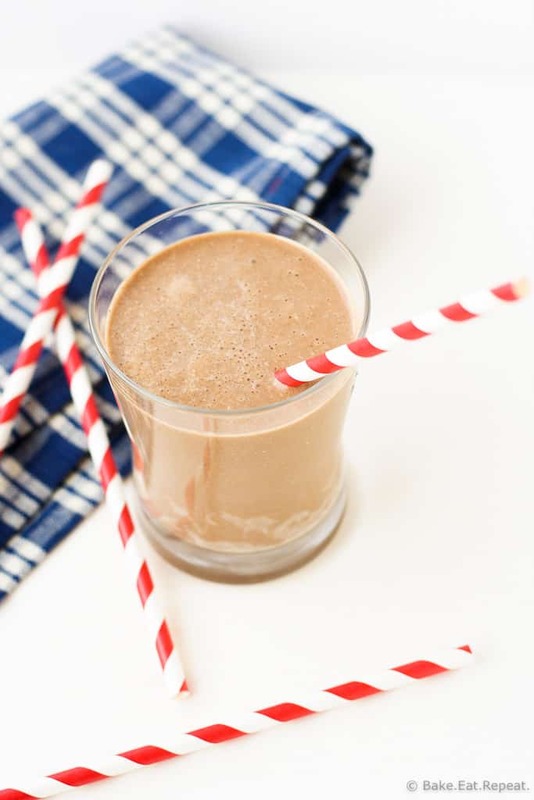 A healthy chocolate peanut butter smoothie is pretty awesome all on it’s own. But adding bananas and oats to it really makes it a full meal, rather than just glorified chocolate milk. I made this smoothie for lunch every single day last week, and only stopped because I had to get my leaky blender fixed. Guess what I made the day I got it back. 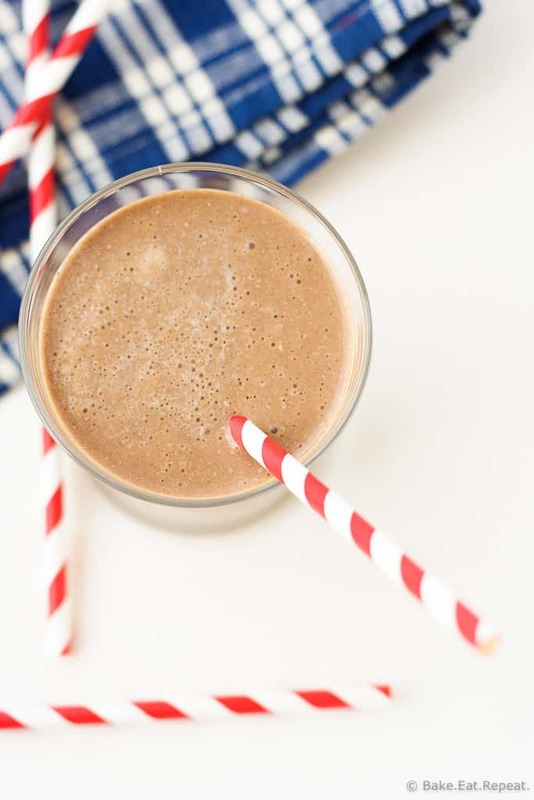 I love this smoothie, as does my three year old – he stole most of mine the other day and I had to make another one. Just like with my oatmeal orange smoothie, you can’t taste the oats as long as you really blend it well. The trick is to grind up the oats in the blender first until they’re powdery, and then add the rest of the ingredients and blend them together. I also use frozen bananas in this smoothie to get that creamy milkshake consistency that makes a healthy meal feel like a treat. All the chocolatey flavour is from unsweetened cocoa powder, and I add just a bit of honey to sweeten it up a little. I should probably have some form or Mother’s Day recipe for you today I guess, not just a smoothie. But this week kind of got away from me. It’s already Friday. I don’t even know how that happened. Everyone in the house was sick this week, which is always fun. We had a huge blizzard on Wednesday, so that was kind of crazy, waking up to 6 inches of snow – and then it KEPT snowing all day long. I did get a nice picture of my tulips covered in snow though, so there’s that. At least it won’t last long, but still. Plus, everything I tried to bake to post for Mother’s Day was a complete failure. Fail after fail this week. I don’t know what was going on. Just one of those weeks I suppose. Where life got in the way of my little hobby here – the nerve! Oh well, if the dessert I made for Mother’s Day is actually good and not a big fat failure, I’ll share that with you next week! If not, well, I can just chalk it up to a bad week and move on. We all have those sometimes. And in the meantime, there’s chocolate peanut butter smoothies. That can’t fail. Ooh, this looks just like my favorite smoothie from Jamba Juice, but now I can make it myself! Thank you!! Thanks Andi! Hope you like it! No mo' snow!!! Good thing you have this chocolate-y peanut buttery goodness to keep you happy! I'm totally making this! Agreed, more snow now would make me very sad indeed. Thanks Senika, hope you like it! Boo to the snow and everyone getting sick. Hope you are all feeling better now. This smoothie looks amazing! 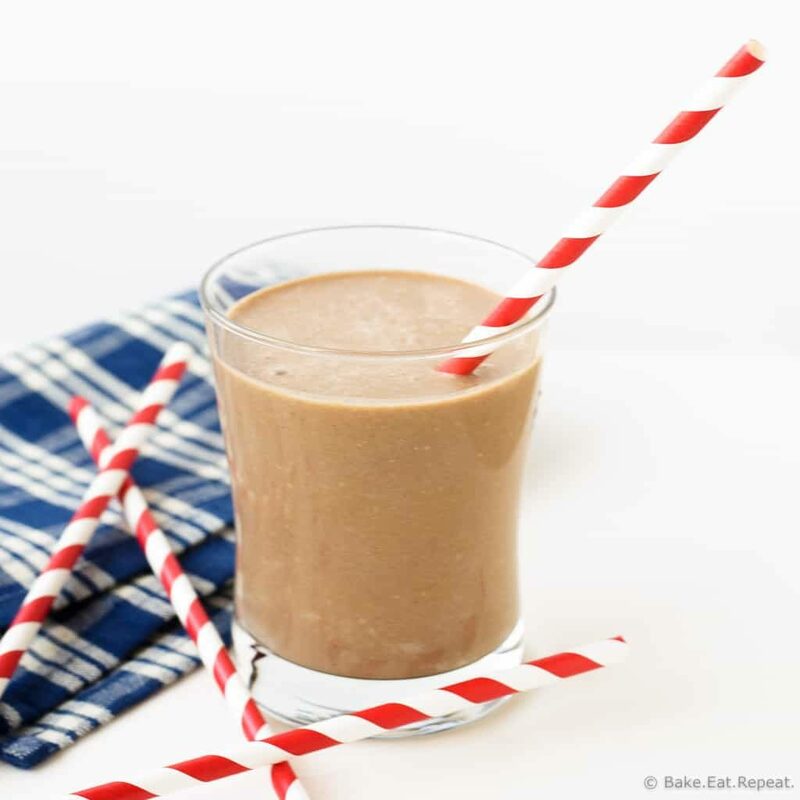 Love the chocolate, peanut butter and banana combo! Everyone else is on the mend now, I'm still fighting it - but a weekend with lots of sleep helped a lot! Thanks Kelly! Where are you? I'm in Calgary and we had snowflakes last week-end, but not actual sticking-around snow...that just seems unfair in May! This smoothie looks delicious! Love that you added oats in there, they give smoothies so much more 'staying power' for me! It's completely unfair right?! I'm near Edmonton, but evidently even Edmonton didn't get as much as we did, so just lucky I guess! It wasn't totally melted until Sat - so bizarre. And yes the oats definitely give smoothies more staying power - I find it's actually a meal for me then! Thanks Denise! This smoothie is just calling my name, Stacey! Chocolate and peanut butter are pretty much the best combination ever! I love how rich and delicious this looks, while being healthy too! Chocolate and peanut butter is definitely the best combination ever! Thanks Gayle! Snow in May! :( It's barely 50 degrees here today... insane. BUT I'll take that smoothie now! Yeah, that happens here, but it's still always annoying just when you think spring is here to stay! Oh well, it's gone now and I can think about summer and flowers! And chocolate always helps! I couldn't imagine it snowing now! Oh man. But luckily you have this smoothie to comfort you. Isn't that what chocolate and peanut butter is supposed to do?! Exactly! Chocolate and peanut butter are great for that! Thanks Meg! Haha, well some of Canada did, just not Alberta. It's why we never plant our flowers till the end of May, even when it's nice you may lose them to a late snowstorm. This one was pretty crazy though, there was a LOT of snow! Oh well, it's gone now and hopefully that'll be the end of it! Thanks Cyndi! I've been looking for this EXACT recipe! Can't wait to try it! It snowed where you live this week?!! And I thought Minnesota was bad! Yeah, crazy hey? But that's Alberta for you, random snowstorms when it should be spring! Oh well, it's gone now! This is the perfect way to sneak in oatmeal for breakfast! And I am addicted to the whole chocolate and peanut butter combo! Can't go wrong with chocolate and peanut butter right? Thanks Mariah! Uh, we got the teeniest bit of snow here. But I am hoping the rest stays away! Otherwise there'll be a whole lot of chocolate and peanut butter in the near future! Haha, yeah May is just too late for snow. It's gone now, but still! Chocolate and peanut butter always helps! That picture of Tulip is so pretty Stacey! but really it needs to stop snowing now at your place! :/ We have all had those days/weeks where nothing works so don't worry about it! Next week will definitely be better! Till then we can all enjoy with Chocolate & PB smoothie, that's something one can never go wrong with! Have a wonderful weekend dear! I seriously should have stuck to smoothies this week Manali - but no, I decided to try all sorts of things and so many fails! Oh well, next week! And yes, the snow needs to stop, but it's mostly gone now, and I don't think it killed any of my flowers, so no biggie! If all my fruit trees have no fruit this fall though I'm going to be disappointed - that's usually the problem with these late snows! Thanks Manali! Have a great weekend!